On February 22nd, after over a week of waiting for pathology reports to come back with a diagnosis, Reese was diagnosed with AML (Acute Myeloid Leukemia). AML is a type of cancer of the blood and bone marrow with excess immature white blood cells. AML progresses rapidly, with myeloid cells interfering with the production of normal white blood cells, red blood cells and platelets. She will be undergoing a series of extensive treatment, including chemotherapy, for an undetermined amount of time. This page is being set up to allow for any friends, family, etc. to help assist Ryan and Jessica with any of Reese's needs for treatment, travel, etc. This year and a half has been really hard for us as a family. From finding out our youngest has cancer to her relapsing and then heart problems and so fourth. This past month they told us yet again, there is nothing more we can do for your daughter. That is never something you want to hear. They sent Reese home and said that we will do what we can to prolong her life but it won't be much time. We have been home for awhile now. We decided that we wanted to try the natural route since all the doctors at St Louis Childrens don't seem to have anything else to try. We are not giving up. 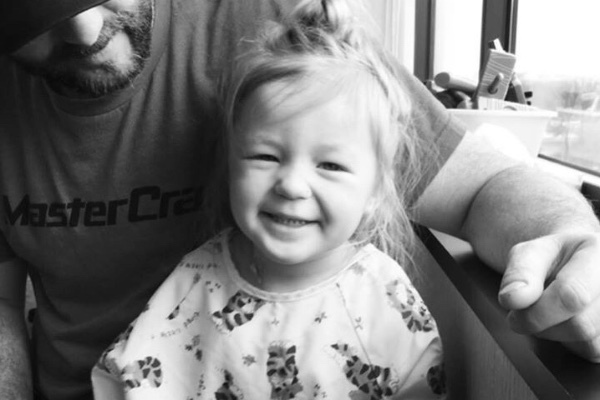 Reese is still pretty strong and she is determined that she IS going to beat cancer. So as parents we stand behind her and are going to do what we can to help her. Things have been really tough. Insurance doesn't pay for the natural vitamins and other things she may need. Reese has gotten very tired and weak but she has her moments where she wants to get up and be mobile. That isn't very often but she has her moments. Rylee is being the best big sister and daughter anyone could ask for. She is so helpful, loving and caring. 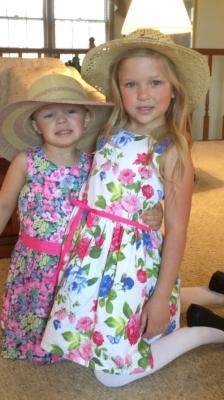 She wants to do anything she can to help her little sister feel better. Recently, we made the decision to get Reese a Golden Retriever in hopes to train her as her mobility service dog. Reese wants to be independent but doesn't love me helping her all the time. So this dog will be able to help her get around more as well as help her to just smile a little bit more. Reese has been all smiles since Bella came into our family. We can't wait for her to be able to help Reese that much more. Reese has been through so much. She doesn't feel well but she still tries to put a smile on our faces any chance she gets. She isn't done and it's not fair that the doctors can just wipe their hands clean of her and tell us there is no more they can do. We are trying everything we can but between helping Reese and getting my apartment clean from the smoke caused by another apartment down from me catching on fire it has been very stressful. Reese can't be in my apartment until we get this smell out and everything cleaned and wiped down. Thank you to each and everyone of you for being here for us in this time of red. For supporting Reese and praying for her. We couldn't have been this strong without each and everyone of you. Please continue to pray for Reese and her recovery. She will beat this and she will be a miracle child. I truly believe that. We have. It updated this since the very beginning, so here is what is going on with Reese now. She relapsed back in November with AML. We had to come back to St. Louis because her heart team is here (she has chemo induced cardiomyopathy). So we started a different round of chemotherapy to get her into remission and then the plan was to take her to get a bone marrow transplant. That didn't happen. She didn't go into remission. The chemotherapy didn't work at all. So now we start all over again. What drug will work for her but won't hurt her anymore then some of them already have (her cardiomyopathy). So the doctors thought it would be best if they started her on a drug called Gemtuzumab. Which is a type of chemo drug that targets a protein well called CD33, which is what Reese has attached to her cancer blasts. But they also paired it with a chemo she has had before called Cytarabine. Cytarabine will run for 7 days straight at a slow consistent rate and then they will give her the Gemtuzumab every other day. We started this on Wednesday and so far she has done well. We don't know if the chemotherapy is working. We won't know that until she is done with it and fully recovered. Once she is fully recovered and they check her bone marrow, IF her blasts are 20% or less they will take her to transplant right away. When she gets into transplant she will be given chemo drugs that could affect her heart a lot more than the drugs she has had before so we are very scared about this process. Not only those drugs that affect her heart but all the other possibilities of catching an infection and whatever else that comes with this process. They say it is the hardest part. Reese has been doing well. She spiked a fever which isn't uncommon on this drug they have her on. But because she has been in bed not moving around she has developed some fluid in her lungs that could be bringing her heart rate down more than it should be. They put her on oxygen last night but was able to take her off of it this morning. Spiking the fever can also make her heart rate drop so there were a few things that could of played a part. Other then these things she is doing well. She is sleeping a lot and super grouchy. But she is tolerating everything well. It's been awhile since our last update... life has been busy and time got away from us. Our apologies for not keeping this updated. If anyone that is following Reese's journey has Facebook you can view the 'Team Reese" page, see what's happening, and get updates more frequently. Reese received another biospy last week on Wednesday and we received the results this past Monday that her cancer is still in Remission!! Since the last update on here we've been in continued remission and only had one small infection on her knee. It started out just a small scrape that turned into a large infection which resulted in an overnight stay in the hospital and 7 days of strong antibiotics administered via her port at home. Reese's mood has been great, she doesn't miss an beat and continually strives to get stronger and is determined on a daily basis to kick Cancer to the curb. Her appetite has been strong and she's been getting plenty of exercise with her and Rylees new trampoline, riding scooters and bikes. 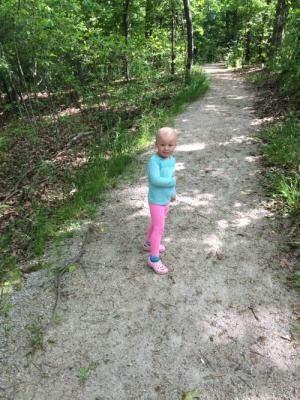 Reese wants to go on hikes whenever the weather is nice and we try and accommodate by frequent visits to the amazing trail systems the state parks here have to offer. Reese will go back for her 3rd round of chemo treatments on next Monday, May 23 and should be there for 5-7days. We'll update this after her next treatment and let everyone know how it went. We want to Thank Everyone for your continued prayers and support!! We appreciate everyone that has helped us and Reese in our mission of Kicking Cancers Booty!! Last Thurs. the 24th Reese's ANC Numbers (Absolute Neutrophil Count) came up to appropriate levels and Reese was allowed to come home!! We needed two days of good ANC count numbers and Wednesday we had come up from 28 to 320 overnight!! So we were anticipating that the numbers would remain high for Thurs. and they held strong but down slightly to 284 which the oncologists say is normal. Once they get above 200 we should see them continue to rise until they reach a normal level for her current condition. Reese has her post chemo Bone Marrow Aspirate tomorrow morning. We should have those test results by this coming Friday or next Tues. April 4th being the latest. A bone marrow aspirate is a test to see if cells in the bone marrow are healthy. Bone marrow is the “factory” where blood cells are made. Bone marrow is found in the center of bones and is made up of both spongy bone and liquid marrow.For this test, a needle is placed in a bone (usually the hipbone) and a small amount of liquid bone marrow is pulled into a syringe (usually 1-3 teaspoons). It is sent to the laboratory to be tested for cancer cells. The bone marrow is examined under a microscope. Often after the first round of chemotherapy, doctors will see no evidence of leukemia cells in the bone marrow. At that point, the disease is considered in remission. However, it is crucial to continue treatment, since there may be some cancer cells left over in the bone marrow or blood that could continue to replicate and allow the cancer to spread. However, remission is a very important first step on the road towards being cured. The results for this test will be the most important information we can receive since initial diagnosis. Of course, we're wanting to put this cancer into remission so that we can continue on the road to kicking this cancer out of her for good!! Reese has been off pain meds for two weeks now and has been walking without assistance for well over a week!! Her mood has been fantastic and she's thrilled to be home with her sister Rylee and her pets!! We appreciate everyone that has made this crappy situation better and appreciate each and everyone of you! We'll be updating this site with Reese's test results as soon as we receive them. Once again we should have results by as early as this Friday April 1 or as late as Tues. the 4th. Jessica, Ryan, and Rylee-words can't express how much I feel for you right now along with the rest of the family. I'm so sorry this happened and no one deserves this. Kaysen is very upset along with you. I've tried explaining things to him, but I have no answers. I'm truly sorry from the bottom of my heart and Kaysen wanted me to tell Aunt Jess that he loves you and misses Reese piece already and that he hopes she still likes his painting he made for her. I've shared your gofundme and my friends are too, we all want to help in any way possible. Please let me know if there is anything I can do and I'm going to go ahead and tell him that you, Ryan, Rylee, and Reese love him back too. Oh Jessie, we just want you to know that you and your family are always in our hearts and prayers.